After declaring the other week that I now know I have a “uniform” – blazer, skinnies and heels – I bring you the third version of this outfit, thus doing nothing to disprove my own theory. 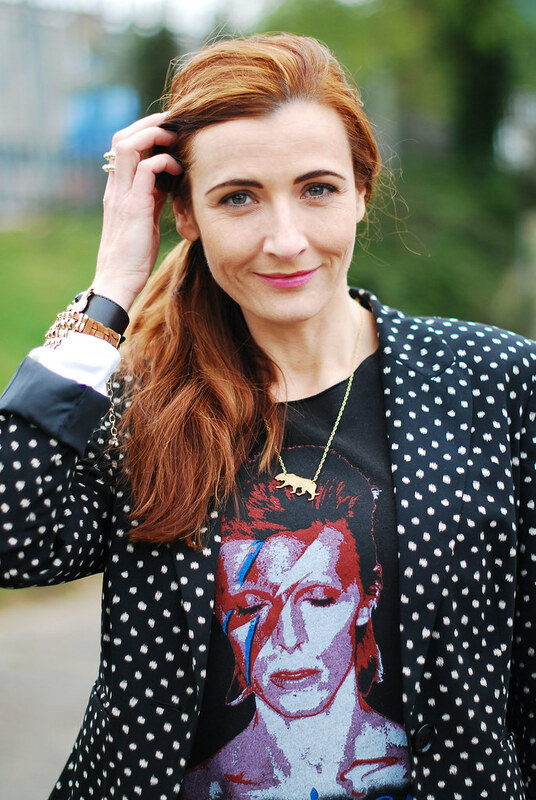 My last post featured white skinnies and a floral blazer, this time polka dots are paired with a Bowie t-shirt (it’s my fave! ), plain black courts and blue denim. I guess if you own a lot of one type of clothing, then it’s inevitable that you end up with outfits that are variations on a theme. I’m not worried, as my tendency towards pattern mixing should still make for some interesting combinations…! Don’t forget: next week is “Vintage Week” at Not Dressed As Lamb. Expect some styling of proper vintage (not the 80s or 90s, in other words), top tips and more! I love everything about this outfit Catherine. I find myself totally relating with it! The one item I'd have to switch out is the heels at this point, but I think my kicks would work just fine. The other thing I'm jelly of (I know, I know, one should never be jealous, but hey! It happens!) is your side pony tail. I used to LOVE wearing my long locks in a side pony tail. In fact, I'd grow my hair out again just for the gorgeous side pony tail. Here's a Kremb de la Kremb sample. See what I mean!? Thanks for coming back to link up to the Kremb de la Kremb Style Stories Link Up. I so love seeing you there! Do you really wear those heels all day? For going to the shops etc? I would never have the discipline, I start with heels and am in ballet pumps within about 20 mins! OMG…I used to get high and put on an all out show for my friends listening to BOWIEE!!!!!!! He IS the man, isn't he Sheree…?!!!! Still!! Love this outfit! Looking absolutely stunning per usual, by the way! You rock the uniform! 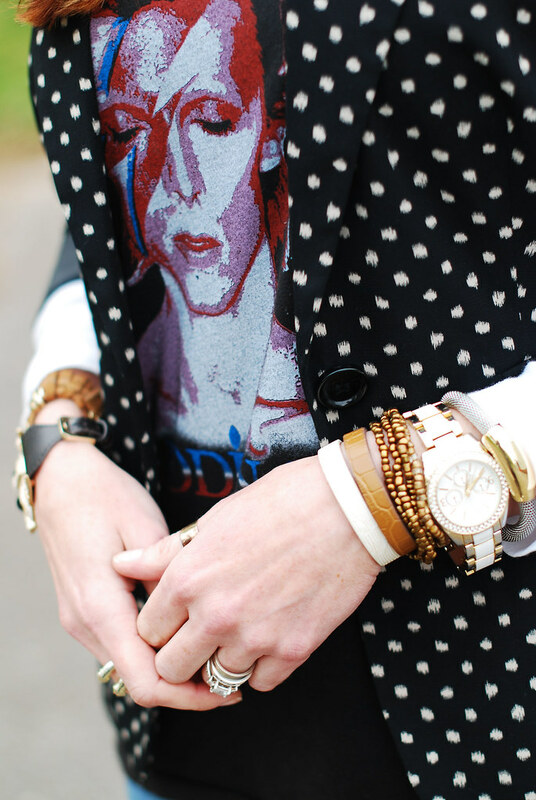 The polka dot blazer is a keeper, so versatile. I virtually live in my polka dot blazer and jeans over weekends, and like pairing it with kitten heels. Very nive outfit! love the second picture and the close up on your face. you are stunning! 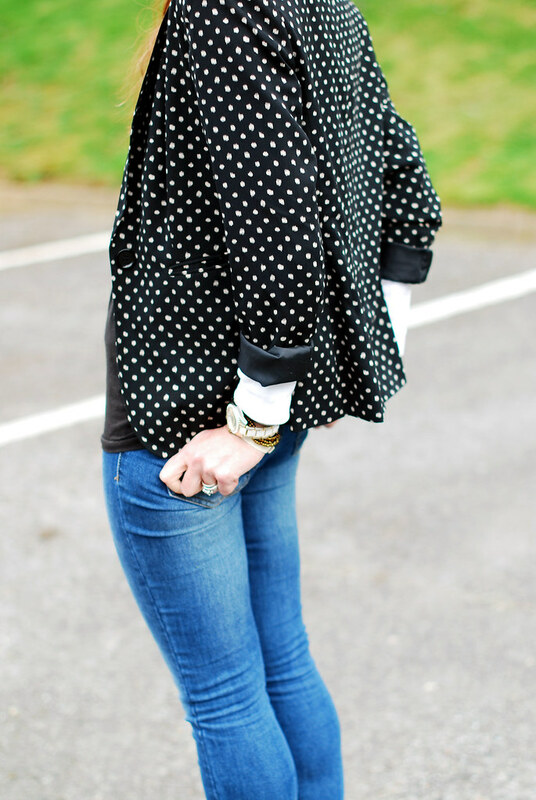 love your pony tail, the david bowie shirt and the polka dots and heels! all around darling! It should be good, Sierra – thanks sweetie! i love that in the close-up picture of your shirt, the bottom of your hair looks like it actually belowngs to bowie! what a great outfit!